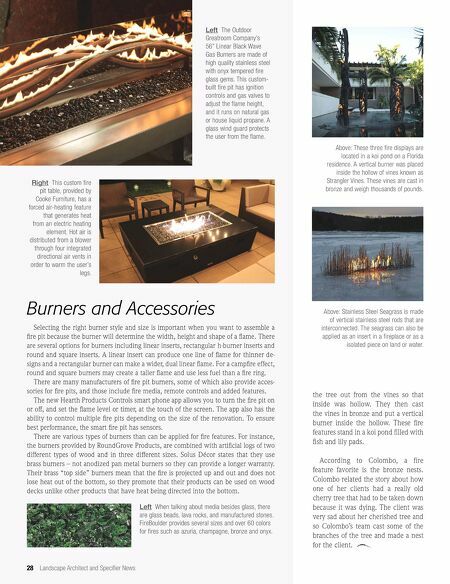 28 Landscape Architect and Specifier News Selecting the right burner style and size is important when you want to assemble a fire pit because the burner will determine the width, height and shape of a flame. There are several options for burners including linear inserts, rectangular h-burner inserts and round and square inserts. A linear insert can produce one line of flame for thinner de- signs and a rectangular burner can make a wider, dual linear flame. For a campfire effect, round and square burners may create a taller flame and use less fuel than a fire ring. There are many manufacturers of fire pit burners, some of which also provide acces- sories for fire pits, and those include fire media, remote controls and added features. The new Hearth Products Controls smart phone app allows you to turn the fire pit on or off, and set the flame level or timer, at the touch of the screen. The app also has the ability to control multiple fire pits depending on the size of the renovation. 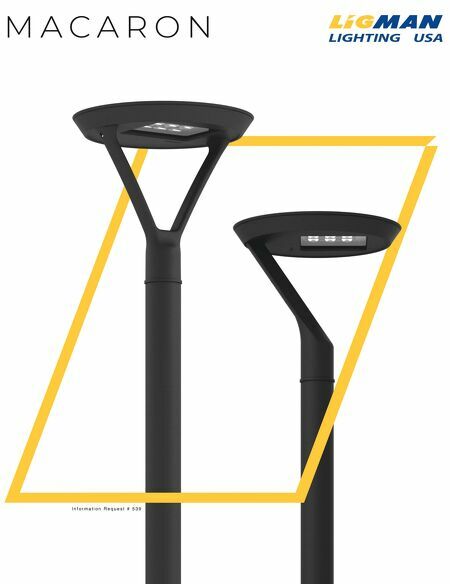 To ensure best performance, the smart fire pit has sensors. There are various types of burners than can be applied for fire features. For instance, the burners provided by RoundGrove Products, are combined with artificial logs of two different types of wood and in three different sizes. Solus Décor states that they use brass burners – not anodized pan metal burners so they can provide a longer warranty. Their brass "top side" burners mean that the fire is projected up and out and does not lose heat out of the bottom, so they promote that their products can be used on wood decks unlike other products that have heat being directed into the bottom. Burners and Accessories Left The Outdoor Greatroom Company's 56" Linear Black Wave Gas Burners are made of high quality stainless steel with onyx tempered fire glass gems. This custom- built fire pit has ignition controls and gas valves to adjust the flame height, and it runs on natural gas or house liquid propane. A glass wind guard protects the user from the flame. Right This custom fire pit table, provided by Cooke Furniture, has a forced air-heating feature that generates heat from an electric heating element. Hot air is distributed from a blower through four integrated directional air vents in order to warm the user's legs. Left When talking about media besides glass, there are glass beads, lava rocks, and manufactured stones. FireBoulder provides several sizes and over 60 colors for fires such as azuria, champagne, bronze and onyx. Above: Stainless Steel Seagrass is made of vertical stainless steel rods that are interconnected. The seagrass can also be applied as an insert in a fireplace or as a isolated piece on land or water. Above: These three fire displays are located in a koi pond on a Florida residence. A vertical burner was placed inside the hollow of vines known as Strangler Vines. These vines are cast in bronze and weigh thousands of pounds. the tree out from the vines so that inside was hollow. They then cast the vines in bronze and put a vertical burner inside the hollow. These fire features stand in a koi pond filled with fish and lily pads. According to Colombo, a fire feature favorite is the bronze nests. Colombo related the story about how one of her clients had a really old cherry tree that had to be taken down because it was dying. The client was very sad about her cherished tree and so Colombo's team cast some of the branches of the tree and made a nest for the client.